We are in two minds about the budget - literally. The survey conducted in the week of its release saw confidence about personal finances plummet to a near three-year low while confidence about the broader economy improved. The Westpac Melbourne Institute survey found confidence about family finances down 5 per cent in the month to a low not seen since mid 2008 in the lead up to the global financial crisis. By contrast our view about economic conditions in the five years ahead ticked up 3.5 per cent suggesting grudging approval for the impact of the budget if not for its effect on us. Optimists outweigh pessimists when asked about the economy one year ahead and roughly balance pessimists when asked about it five years ahead. Labor voters are far more optimistic than Coalition voters... and more so after the budget. Optimists among Labor voters outweigh pessimists by 24 percentage points while pessimists among Coalition voters outweigh optimists by 6 points. At the National Press Club yesterday shadow treasurer Joe Hockey said there was “resentment growing” in middle Australia about the budget and the feeling the government had lost touch with it. The Westpac survey shows high earners on more than $60,000 broadly optimistic, their outlook apparently little shaken by the budget. Workers earning between between $40,000 and $60,000 suffered a sharp loss of confidence, their index sliding 14 per cent from positive into deeply negative territory. Separate wage cost figures released by the Bureau of Statistics show broad pay increases contained the March quarter at 0.9 per cent, climbing 3.9 per cent over the year. High increases in the mining industry and in two of the states dominated by mining appear not to have flowed on to other workers. 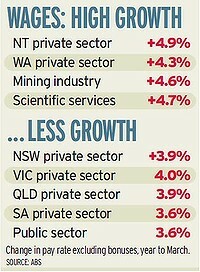 NSW and Victorian private sector wages climbed 3.9 and 4.0 per cent and public sector wages 3.6 per cent. In the mining states of Western Australia and Northern Territory private sector wages jumped 4.9 and 4.3 per cent, with the wages paid to Western Australian miners climbing 4.9 per cent, far in excess of the 4.1 increase achieved by Queensland miners. A spokesman for workplace minister Chris Evans said the Labor innovation of enterprise bargaining and the Fair Work Act were keeping spillovers in check. ANZ chief economist Warren Hogan said the wage news “failed to deliver the Reserve Bank a smoking gun”. “There is little urgency to follow up with further tightening. We now favour the next rate rise to occur in August, rather than June,” he said. "The consumer is definitely feeling the pinch in New South Wales and Victoria," Dow Jones quoted him as saying. "This ongoing debate about the economy, and the obvious implication that if things continue there will be further increases in interest rates, is very sobering for most Australians." Mr Corbett is a former chief executive of Woolworths, chairman of Fairfax Media (publisher of The Herald) and has served on the Reserve Bank board since 2005, being reappointed for a further five year term in December.